If you want to generate an enhanced online-presence for your health-related website, you don’t need to make lots of efforts to achieve success. 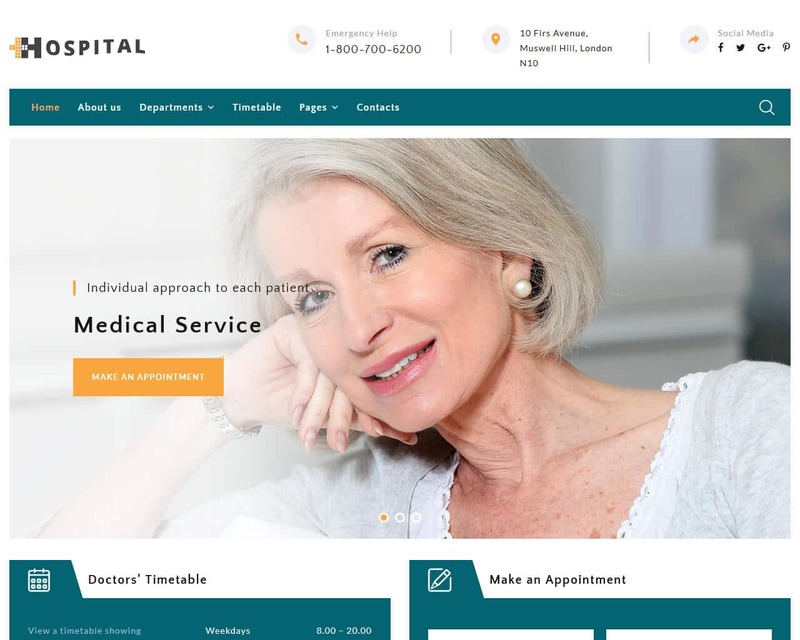 In order to create a website that can be called a fully-personalized to the needs of your medical practice solution, you can choose one of the most eye-catching medical website templates. There have a plenty of advantages that will assist you in building an extraordinary online-presentation of your great services. All of these exciting templates, that we decided to include in this selection, are designed to impress and boost a popularity of your online-project. Believe us, it’s completely impossible to be disappointed with your choice. If you want to keep your target audience advised of your updates, one of these ready-made solutions can become your amazing assistant. With the help of these powerful templates, you will be able to save a time both of your clients and staff. People will get the opportunity to request an appointment online and also ask all essential questions directly on the website. In such a way, you can be sure that you can promote your medical services at their best and increase the number of your customers. 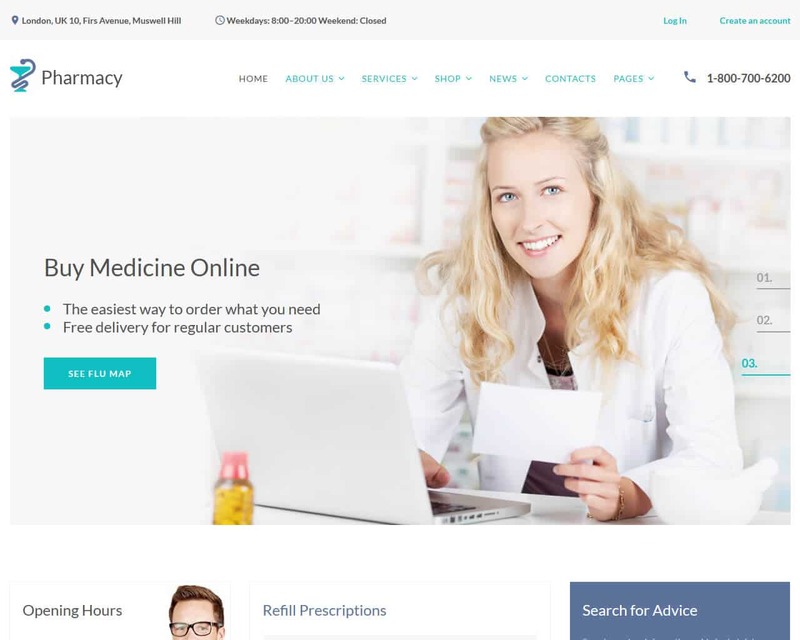 Pharmasy is an excellent template that delivers the highest level of user-experience. Its goal is to combine convenience, flexibility, and minimalism in one single design. It has a fully-responsive design that quickly adapts to any gadget with any screen size. Images and text will also be rendered correctly. Each person will be ready to browse your website without any limitations. In addition to this, this eye-catching theme has 30 pre-made HTML5 pages. This means that you can show off your news, services, media, products, and so on and so forth. Remember that no coding skills are needed to get your online-project ready. Everyone can play around with a design without any efforts. In such a way, you can create a website look that fits your main concept. Actually, there are even more powerful tricks for you to expect. An exciting template that gives a chance to present your medical mission. All features that might help you in this purpose are included in the package. To start with, it will impress both you and your visitors with its simple but elegant design. What is more, this design is a fully-responsive one. This means that you do not need to worry about how a website will be rendered on different gadgets. Sensiv says no to chaotical dispositions of your texts and images. It is also important to mention a user-friendly contact form. If your readers have some questions, they can ask them and give credit to your services. Yet there are not all features that this modern template is going to gladden you with. Even more options to get the most reliable online-project are waiting below. 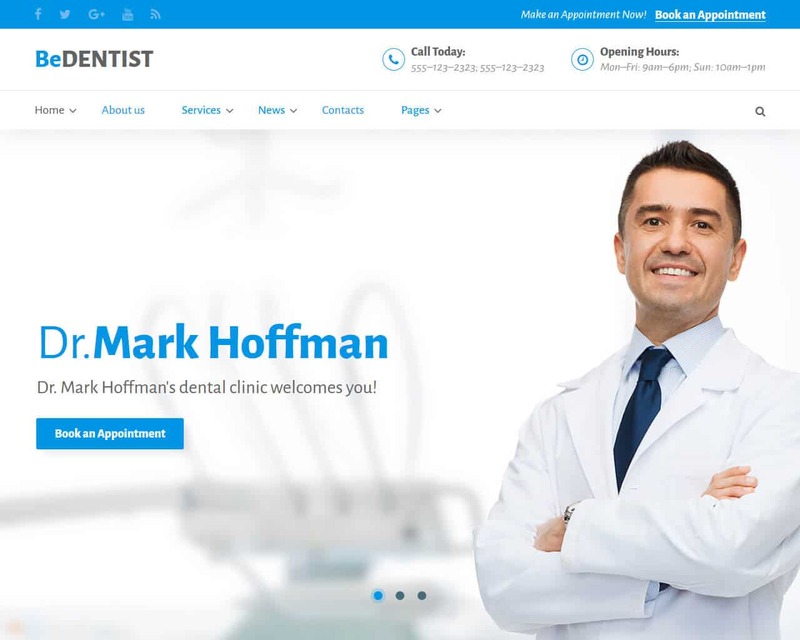 If you want to showcase your dental clinic in the best possible light, it’s crucial not to pass by this exciting template. It comes together with a snow-white layout that will assure people of handing their dental health concerns to your skillful hands. You will be glad to get multiple header and footer layouts that will allow you to create a unique look of your website. Furthermore, you can work with fonts and colors of your future online-project and easily turn your website into an extremely impressive one. It also has six eye-catching blog layouts that will make it possible to show off your interesting articles and make people find out more information about your services. In order to present your crucial content (like promos, new products and services, and many other things you desire to highlight), you can make use of the amazing website slider. In such a way, you can be sure that people will entrust in your clinic and its capability to deliver the best possible healthcare to all your patients. 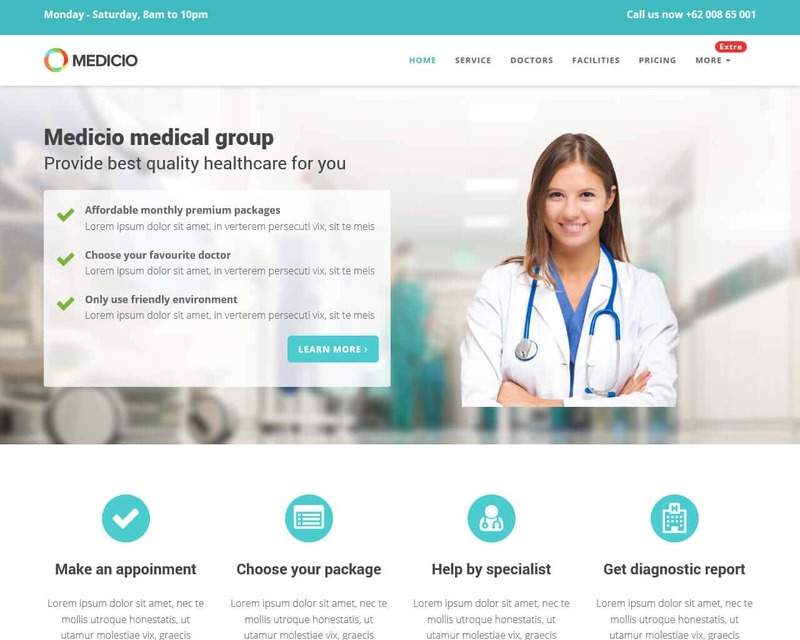 Medicio is a landing template that is designed for healthcare and medical field. It is suitable for doctors, dentists, clinics, and all other medical and health companies. It comes with a very professional design that will enhance your appearance online. This template has a very clean and well-commented code that you can use if you want to edit anything on your site. It is also compatible with almost all browsers which are a good thing as you are not, in any case, limited to specific ones. With Medicio, you get ten predefined color skins that you can easily change if you wish or even add the ones that you want according to the logo and color of your company. It comes with four variations just above the fold area slider. It also has video and call to action. Medicio is perfect for you if you are looking to get serious with your site in terms of business. 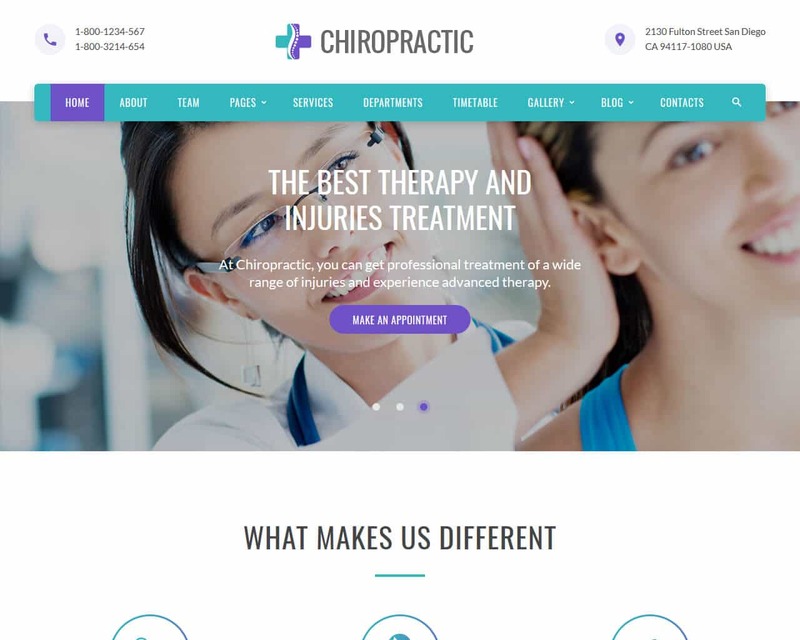 A stunning theme that will make your potential clients pay more attention to your chiropractic spinal healthcare and choose exactly your services. By means of various good-looking pre-made pages, it will be possible to showcase your professional services in the most eye-catching way ever. In such a way, you can be sure that you will be always ready to present your modern techniques, qualified specialists, and therapy services. In order to make your website look more visually-attractive, you can take advantage of different gallery types. Thanks to them, you can easily make your high-quality images look even more remarkable and exciting. You will also get five blog layouts that will allow you to showcase your posts in a creative way and make people become interested in your services. Your visitors can always book an appointment directly on the website using a powerful appointment manager. They will be always able to ask you some questions with the help of the amazing contact form. 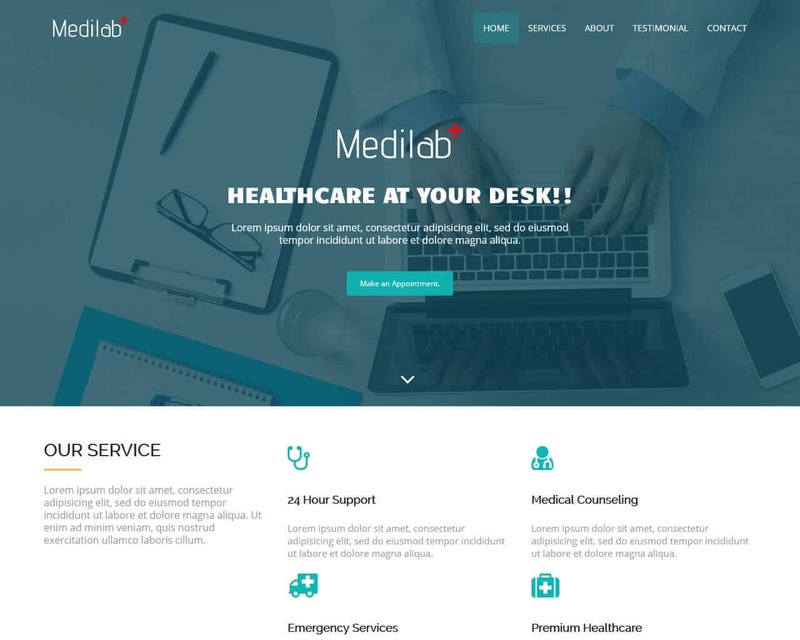 Medilab is a creative template that is built on top of a very popular and modern Bootstrap framework. It is ideal for hospitals, clinics, doctors, dentists, nurses, medical, health and so much more. It is beautifully crafted and well structure which makes it very easy to use. It is not multipurpose because it is specifically designed for medical purposes only. Medilab template is unique as it comes with special features, unlike almost all others. Some of these special features are appointment forms, doctors, services testimonials, gallery items, and more. In addition to those features, you also get font awesome icons, custom-made icons, great color combination, cross-browser compatibility, very easy customization, a code that is well organized and clean and so much more. This template is necessary if you are interested in taking your website and online appearance to the next level. Are you dreaming of getting a fully-functional and impressive website regarding your healthcare services? With the help of this amazing theme, you will get a wonderful chance to create a fast and reliable online-project that will catch the eye of your target audience. Together with this ready-made solution, you will get a lot of opportunities for customization that will assist you in getting a tailor-made online-presentation of your hospital. It comes alongside a bunch of attractive pre-made pages that will make it possible to hit the target and make people choose your services over competitor’s ones. In addition to this, they can easily communicate with your team in order to find out more about your clinic and entrust in it. If you want to share some interesting details about services, you can always make use of the marvelous blog functionality. Don’t forget that it’s possible to show them in different layouts and make people become interested in your website. Without a doubt, this unusual template will become your great assistant in launching a modern website that will make people pay their attention to your online-project. Together with this powerful solution, you will get an amazing collection of pre-made pages that will allow you to present your services, doctors, and many other important things in the best possible light. In order to make your website look more visually-attractive, you can brighten it up using a wide range of animation effects and transitions. Thanks to various modern Google Fonts, it will be completely possible to make your texts become more readable and attractive for your core audience. By means of the user-friendly Google Map, you will get the opportunity to show a physical location of your clinic. You can easily save time of your visitors. With the help of the marvelous appointment manager, people will be able to see your schedule and request a meeting in the most appropriate time for them. 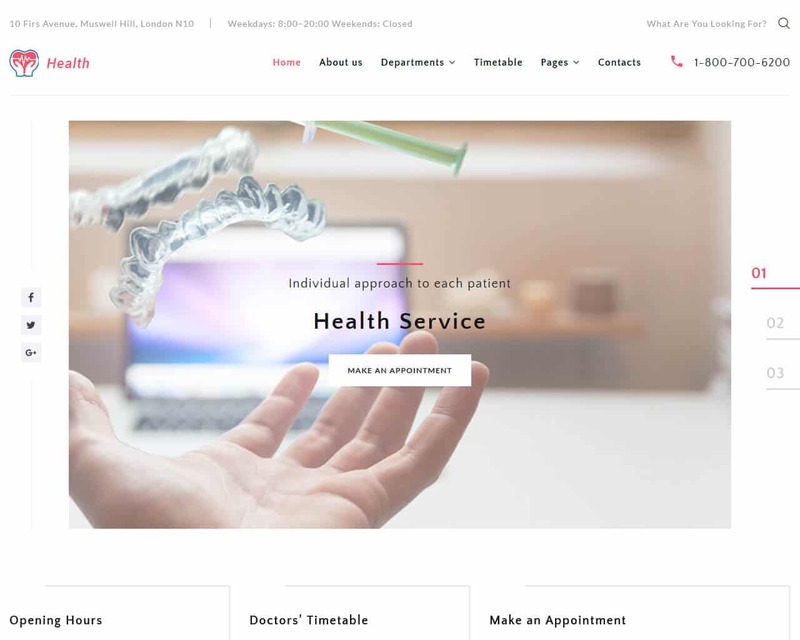 Just as the name may suggest, Health Medical is a template that is uniquely designed for all websites that are related to the health and medical field. It is ideal for clinics, doctors, dentists, hospitals, and so much more, although it is limited to that field. It has many predefined web elements that which will enable you to build your site easily and also effectively. This template is built with Bootstrap framework which is a unique and modern framework that is necessary for the development of a great template. Health Medical is compatible with all browsers, and that makes it even more suitable for you. You will get good documentation, a clean, organized and well-commented code that you can effortlessly use to edit your site to your convenience. This template will certainly enhance your online appearance and also take your business a notch higher. This template is a little bit different from others because of its uniqueness and sleekness. It is specifically built for, private clinics, plastic surgery clinics, personal doctor's pages and dental clinics. It comes with a big set of components and styles which are unique and will go hand in hand with your website. With medical care, you will get photo galleries, procedures, doctor's pages, personal pages, and blogs. All this will certainly make our site standout as clients can get all the information that they need in one place. 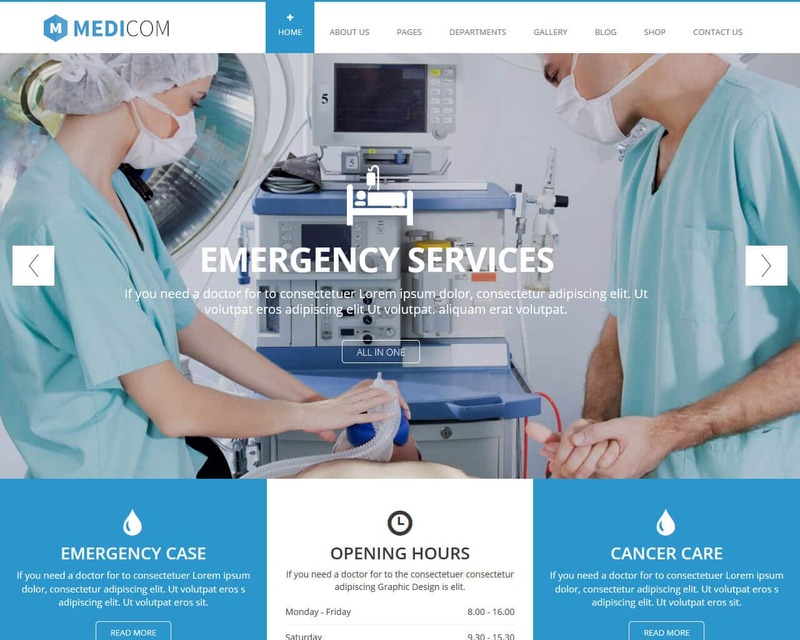 Medical Care template will enhance your site and will help you showcase your skill, thought and ideas. Your clients will get prices even before they come for consultation as it is well listed on your site with the help of Medical Care. All its great features will make your website look very professional and therefore generate more business for you. 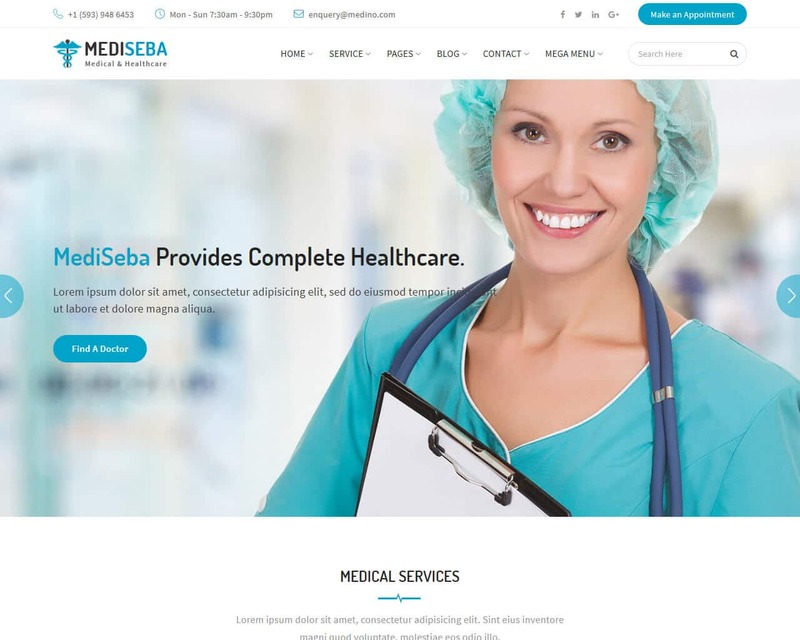 Mediseba is a modern template built specifically for medical and healthcare fields. It is a minimalist solution that is crafted with the latest framework. 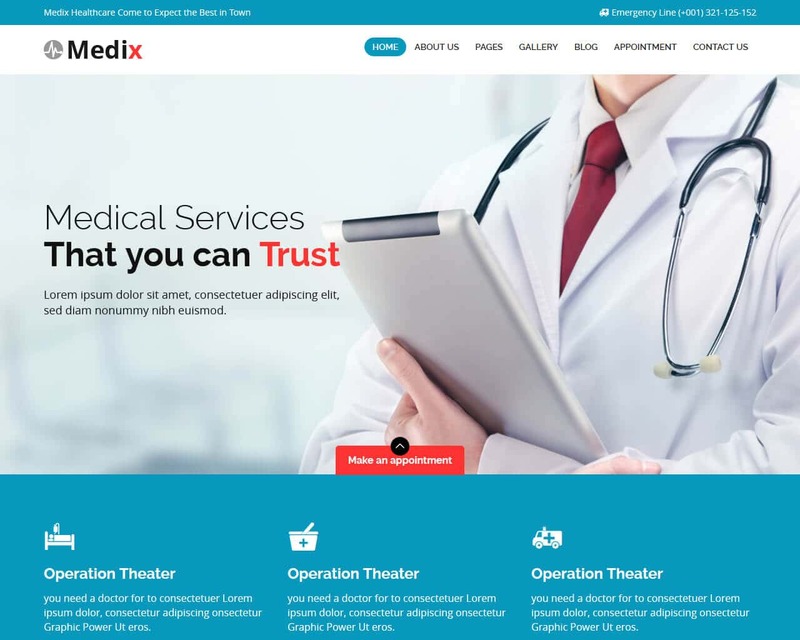 It is suitable for, Healthcare, Hospital, Doctor, Surgeons, Dentists, Clinics and many more websites that fall under the medical industry. Mediseba comes with great features that will make your site look amazing and stand out when compared to other sites. Some of these features are, good documentation, an easy, SEO optimized and well-organized code that you can easily use to edit your site if you find something you do not like, it is compatible with almost all browsers, you get 1 ready homepage and more coming soon pages, Google fonts, font awesome icons, 30pages and more, Ajax powered contact form that is already working and many more features. If you want to improve your website, choosing Mediseba will greatly help you. 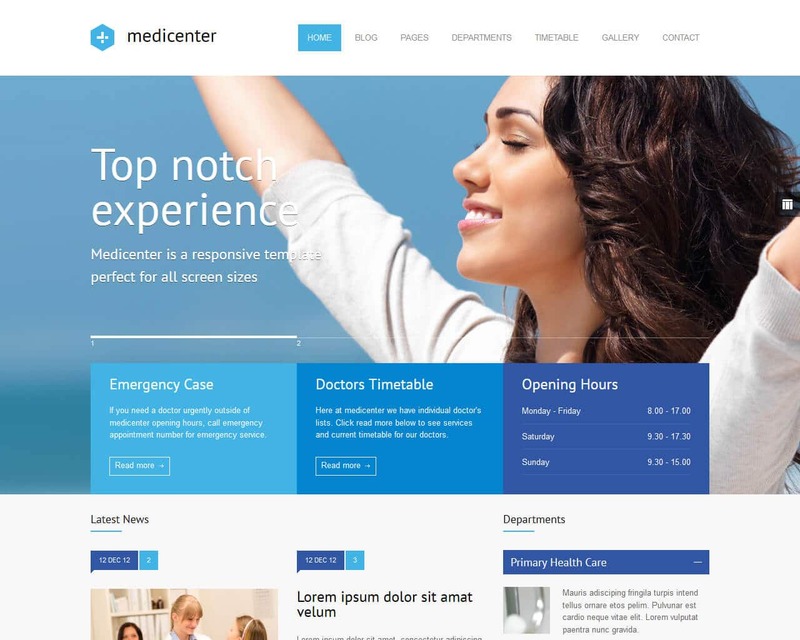 MediCenter is a perfectly designed template to suit your website. It is most ideal for hospitals, clinics, health care, and other medical organizations. You can also apply it to beauty, and health-related businesses like, Gym, Spa, Pharmacy, Laboratories, Veterinary, health care professionals, Ophthalmologist, the list is endless. 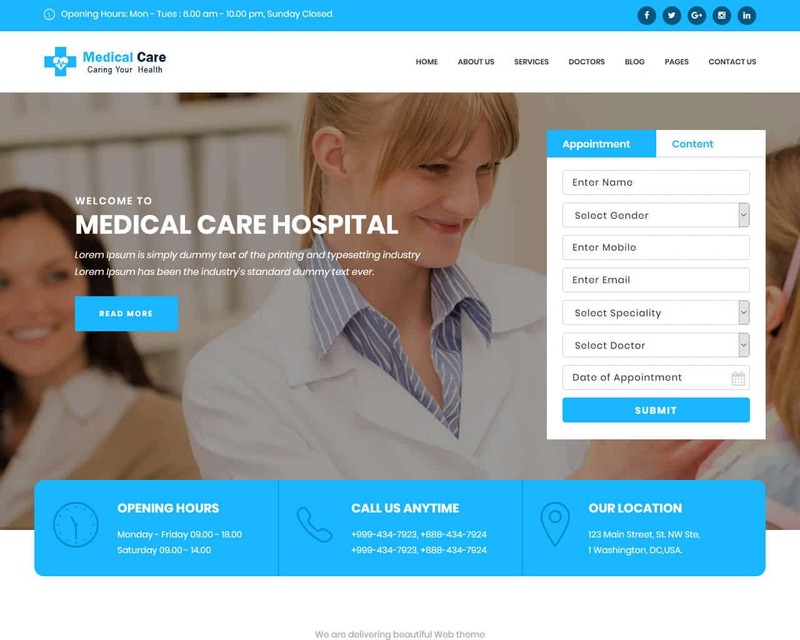 MediCenter template is easy to customize, and it comes with a very organized code that you can use with ease to change whatever you do not like on your site or maybe add anything that you wish to. You can use this template on all browser as it is fully compatible. In addition to that, this template comes with wide and boxed page layouts, six homepage layouts, 20+page templates, 50+ icons, ajax appointment form and so much more. This template will definitely make your site look better and also generate more clients for you. With this template, your site will look as professional as possible. 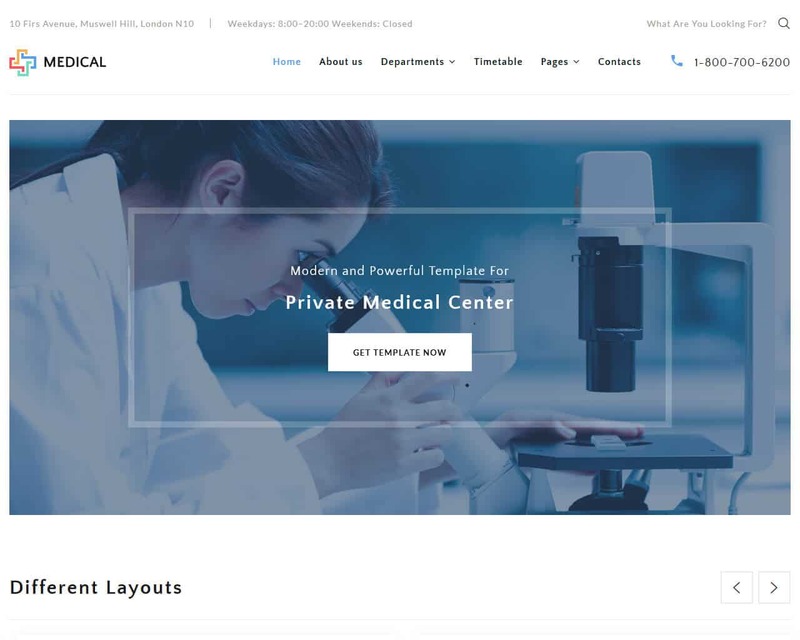 If you want to present your private medical center in the most modern way ever, it can be crucial for you to bring this beautiful template to your notice. It comes together with multiple header and footer layouts that will allow you to create a tailor-made look of your future online-project. You can also add different engaging animation effects and transitions that will add some eye-catching visual tricks to your website. Do you want people to get familiar with different details regarding your services? In such a case, you can take advantage of the powerful blog functionality. By the way, you will be happy to get amazing blog layouts that won’t allow people to click off a tab of your website. Thanks to a wonderful website slider, you will get the opportunity to present your hottest offers, upcoming projects, and many other important things that should capture the attention of your clients. This is a great template that is perfect for health and medical websites. It can be used by Doctors, Surgeons, Health Clinics, Dentists, Hospitals and so many other health and related medical organizations. Its design is purpose-oriented, and it comes with unique features like doctors, gallery items, services, testimonials, appointment forms and many more. Medix has a clean and organized code that you can use effortlessly to edit your site at your convenience. It is easily customizable and can be used on different browsers. It also has some of the best features that you cannot find on most templates, you will get a variety of homepages, font awesome and font icons, a beautiful and very professional design that will enhance the appearance of your site and also get you a great audience which will later take your business to the next level. If you are looking to improve your site, this is the template for you. A great medical solution that will allow you to convince people of selecting exactly your clinic and its professional services. In order to make them believe that your team will provide your core audience with an individual approach to every patient, you can make use of various incredible options included in the package. If people want to get updates on your upcoming projects, you can give them this opportunity using a powerful newsletter subscription form. Your clients can always book a meeting directly on the website with the help of the feature-rich appointment manager. Sometimes it can be crucial to add some attractive details to your online-presentation. In this case, you can do it using an impressive collection of different animation and transitions. They have the power to make your website look more eye-catching and remarkable. By the way, they include a remarkable Parallax effect that will certainly make a user-experience of your visitors better. 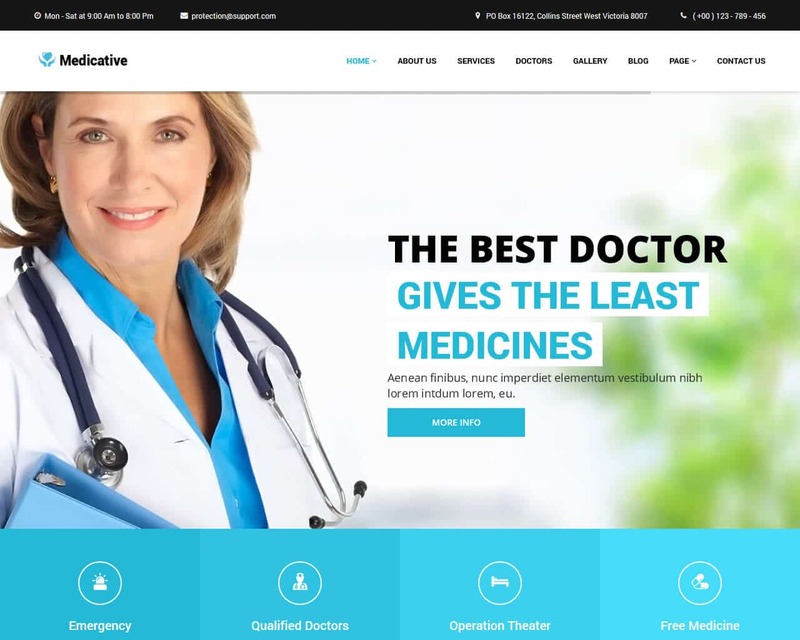 A stylish theme that is considered to be a perfect variant for creating a health-related website that will impress the imagination of your target audience. Thanks to its exciting design, it will be possible to increase the number of people who can become interested in your services. It comes alongside various theme color options that will allow you to convey your main message using colors. Moreover, a wide range of eye-catching Google Fonts will assist you in making your website look more interesting for your potential clients. In order to make your clients find out more about your medical services, you can take advantage of the powerful blog module. By means of this amazing functionality, it will be possible to present your exciting articles in the best possible light. It will be also possible to show a physical location of your clinic using a stunning Google Map. In such a way, your services will turn out to be more trustworthy and reliable. 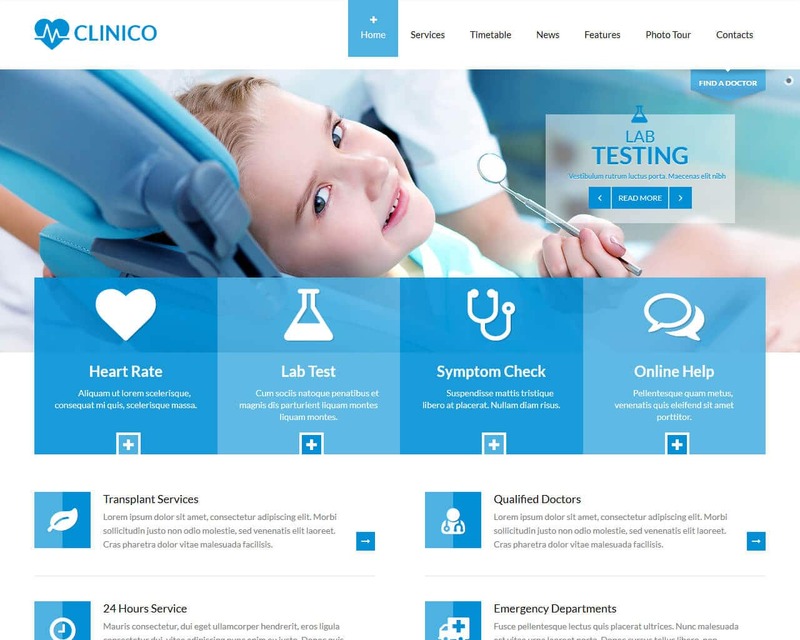 Clinico comes with a flat and very clean style and is built with Bootstrap framework. 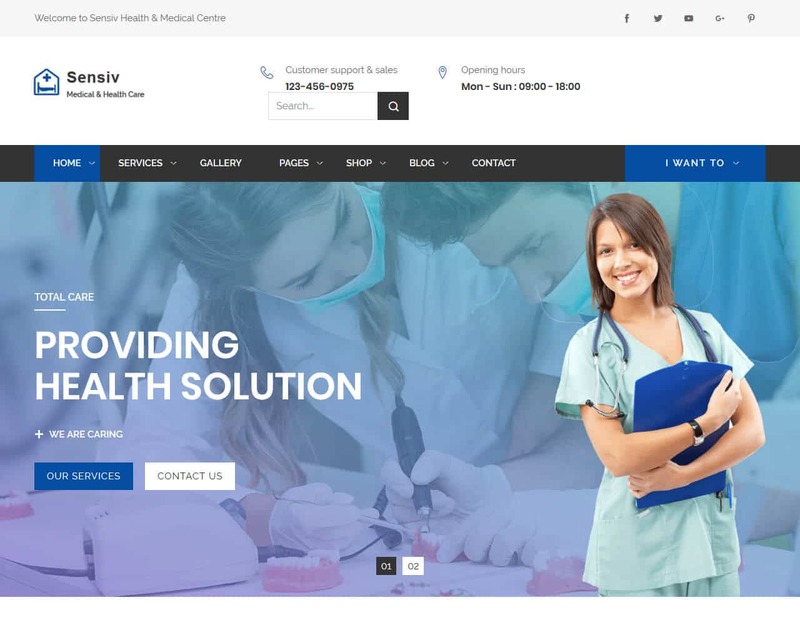 It is a very powerful multipurpose template that is ideal for, medical and all health-related businesses. It can be used by corporate websites, personal blogs, and product-oriented sites a well because it has a clean and very fresh design. This template can be used on all browsers as it is fully compatible. It has six predefined color schemes that you can easily use, but you can also choose from your own collection. Clinico has wide and boxed layouts and is very easy to customize. This template comes loaded with a variety of page layouts, an already working contact form, content elements, twitter widget, and so many more great features. With Clinico, you will also get a code that is very well-commented, and you can use easily to edit your site. 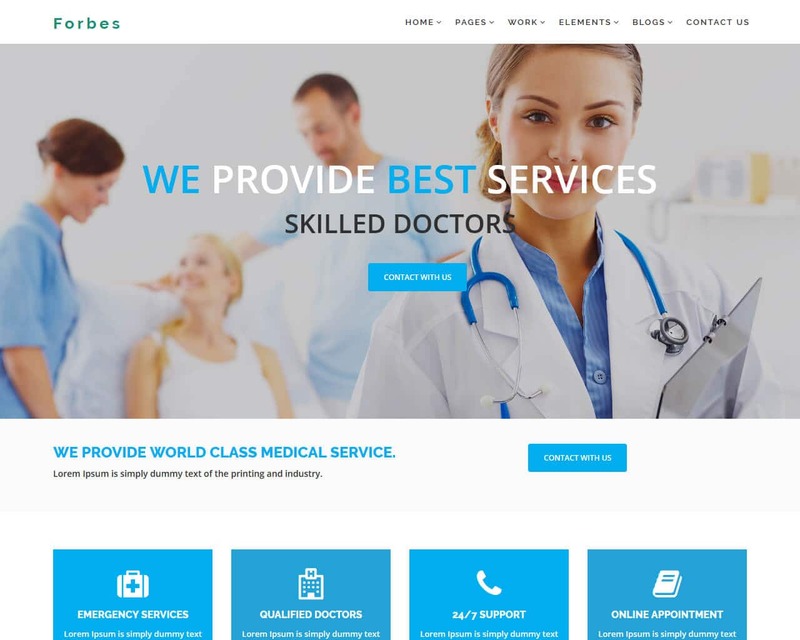 If you want to get the opportunity to boost your medical business and assure people of choosing your service, you should certainly make use of this modern template. With the help of this eye-catching theme, it will be possible to make a focus on your information and present the most important content in a clutter-free way. Thanks to a fully-fledged Revolution slider, you will get a wonderful chance to create sliders and carousels with your exciting offers. Furthermore, you will be ready to create nice-looking slideshows that will present your impressive photos in the best possible light. It also includes a wide variety of social links that will make lots of people pay more attention to your online-project. In such a way, you can be sure that your core audience, which likes to spend their time in social networks, can also find out more about your business and its powerful advantages. 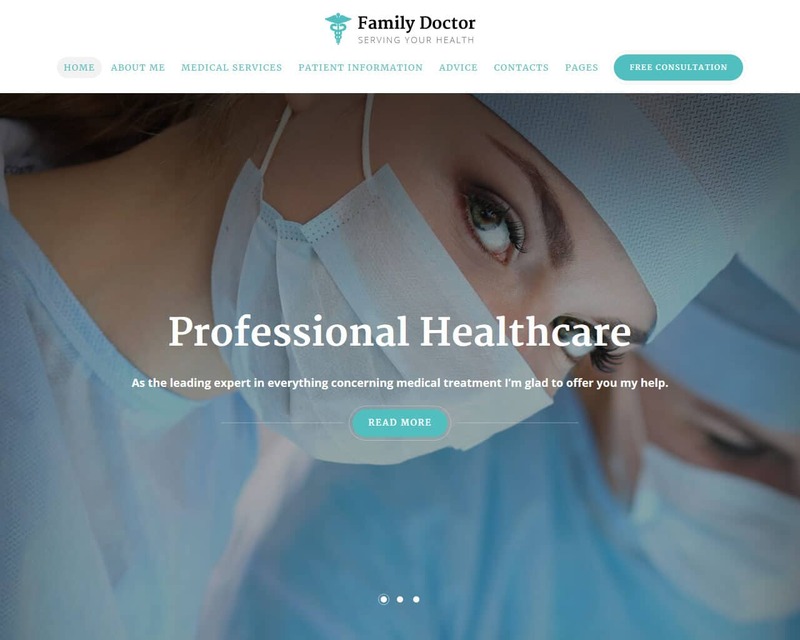 An attractive and feature-rich theme that will allow you to make people believe that your family healthcare can be called a leading expert in everything concerning medical treatment. Its minimalist design won’t distract the attention of your visitors from your content. It will impress your imagination with a vast number of excellent pre-made pages that will make it possible to showcase different aspects of your services at their best. Thanks to a wide variety of working forms, you will get the opportunity to make people entrust in your clinic. Each person, who wants to choose your health-related services, can easily ask you some questions using a user-friendly contact form. By means of various animation effects and transitions, it will be completely possible for you to add some visually-attractive details to your online-presentation. In addition to this, you will get amazing Google Fonts, blog layouts, and many other features that will make people become interested in your website. 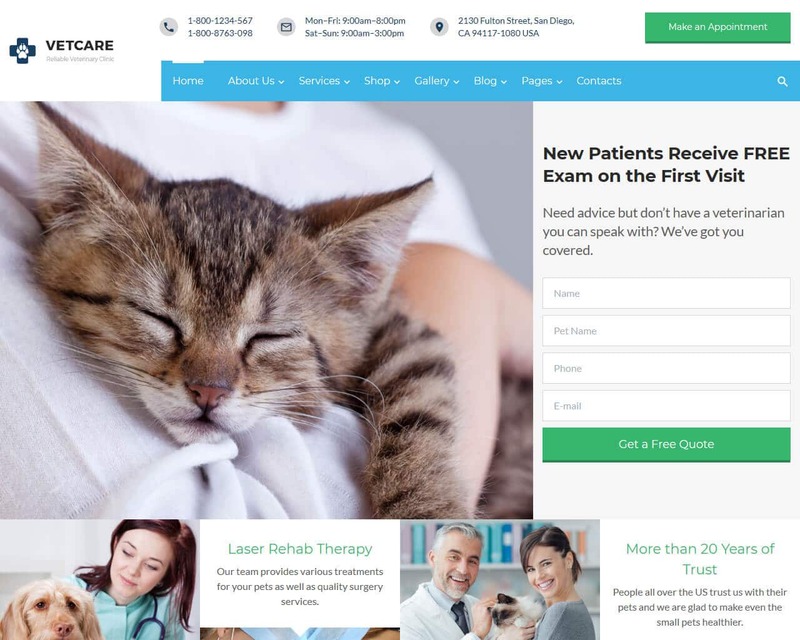 VetCare is an impressive and good-looking solution made for owners of veterinarian clinics who want to promote their amazing services all over the Internet. You will get lots of remarkable pre-made pages that will assist you in presenting your team and their achievements in the best possible light. Thanks to a wide range of multiple gallery types (like cobbles, grid, and masonry) that will allow you to showcase your attractive images in the most stylish way ever. In order to make them look even more exciting, you can add eye-catching animation effects and transitions to your future online-project. By means of various blog layouts, you will get the opportunity to make the most out of your articles and turn your website into an extremely beautiful one. Don’t forget to make use of multiple Google Fonts, working contact form, Google Map, and slideshow that will enrich the functionality of your website. Medical pro is definitely a library for health and medical. It comes with great features that are all necessary for someone looking to improve their online appearance. 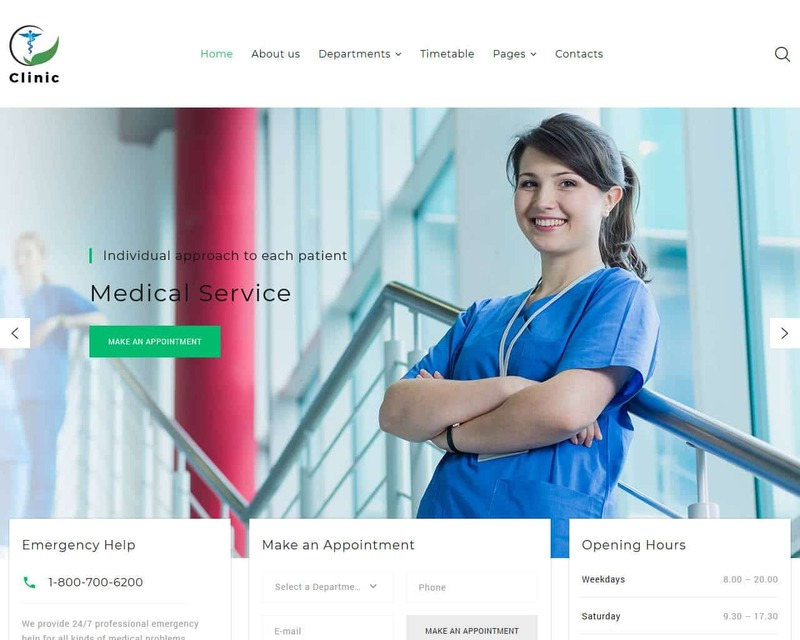 This template is uniquely designed for doctors, fitness, health care, hospital, medicine, professional and surgeon websites and many more. This template will work perfectly if you are interested in showcasing your work, skills and great ideas in an online platform. Some of this templates great features are, a good documentation, multi-browser compatibility, it comes with a very clean and neat code that you will need to edit your site, therefore, making it easily customizable, you will get a variety of homepages and blog pages and also different color skins to choose from, it comes with font awesome, Google maps, an already working contact form and subscription forms where your clients can get newsletters and more. 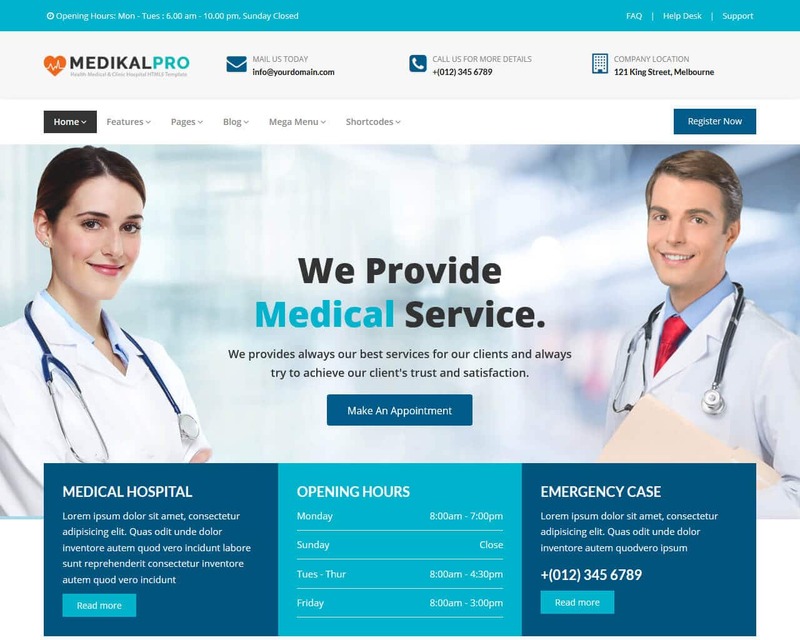 Medical is certainly a great choice for your website. Medicom is definitely a wonderful template that you can easily apply as it is very straightforward. 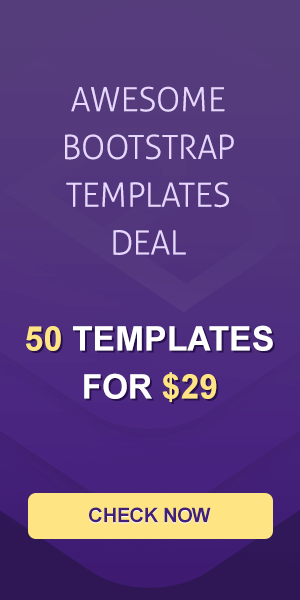 It is built with the Bootstrap framework which is a very good foundation for any template. It is best for hospitals, clinics, dentists, medical and all other fields that are related to health care. It is well documented, and it also has a very clean code that you can effortlessly use to edit your site whichever way you wish. It is well structured and has a very good design that will without a doubt attract customers your way. 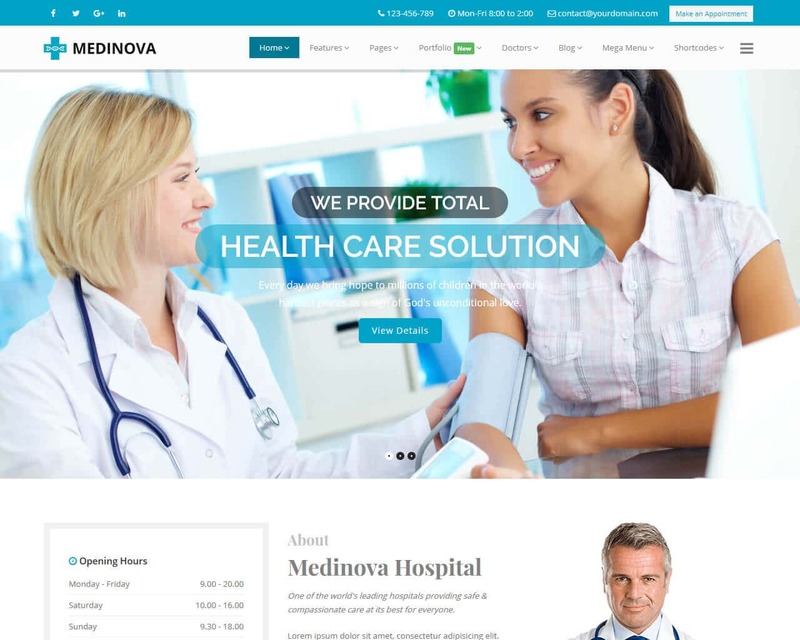 Medicom comes with amazing features like, parallax scrolling effect, eight color variation, working ajax forms, wide and boxed layout, awesome font icons, drop down menu and mega drop-down menu, four different homepages, W3C validated and so much more that will improve your site and also make it more appealing.